Since 1956, Bestway Electric has been of service to people across Ontario and the entire GTA. Family owned to this day, we have been able to service the needs of residential, commercial and industrial customers and have literally serviced thousands. With our more than 60 years of experience, Bestway Electric has established a reputation as being a "quality" electrical contractor providing excellent work at a fair price. We are service-oriented bringing a broad background of electrical knowledge to make your next repair or installation happen with ease. When hiring a Contractor we suggest that you ensure the Company is qualified to do the work. Have a current "Certificate of Qualification" (electrician's license) applicable for the type of work you are having done (there are different licenses for various types of work). 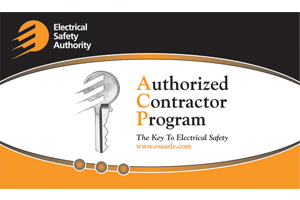 Are prepared to take out an "application for inspection" and will provide you with a copy of the "Certificate of Inspection" from the Electrical Safety Authority. Have coverage with the Workplace Safety and Insurance Board (WSIB). Have a Municipal business and/or contractor license (where required). Are prepared to provide you references. I wanted to take a moment and thank you for the great work you did. You made doing business with you very easy and your level of interest even in a small project was one of the reasons we went with you. I also wanted to ask you if you would do an estimate for my parents home? They live in a home that built in 1949 and if memory serves me correctly the original service was 60 amps – because people typically did not have huge appliances back then. Anyhow over time box after box was added to their electrical system and they have had some challenges with work that has been done for them in the past. They would like an estimate on rewiring a part of the home. Liz and Jeff … Thank you. My problem turned out to be simple but it was still a real problem until solved. I also got expert advice on another project. Bestway did a great job yesterday – it’s so nice to finally have light!! I had no problem setting the timer for the outside lights – pretty good instructions. We bought a hot tub before realizing the expense of installing it. You were not the cheapest but “you get what you pay for” and we would choose you again anytime. We called many contractors – you were the only one willing to take on the challenge in our old office building downtown – you are now “our” electrician. Thank you Jeff for the excellent work. You came recommended and we made arrangements for you to find the key. You came, you fixed, you made us happy! At Bestway Electric we are not always able to serve people who contact us … here is what one person had to say … Thanks so much, I appreciate your response even though you are too busy to do my job. Some companies wouldn’t have bothered to respond once they will not have the time to do the job. Thanks once again! Thanks to Bestway you enabled my staff to have better lighting and a safer environment … many thanks! Other contractors told us there was no way to fix the problem other than to tear down the ceiling. You were able to quickly fix the problem and we are very grateful for that. Today, Jeff came here to fix all the problems we have. Jeff worked from 2 pm to 8 pm to fix these. I have never met such a great guy like Jeff. Thank you very much for doing such an excellent and professional job on our house. You were a pleasure to deal with both personally and professionally throughout the experience. I hope you don’t mind if I give your number to my friends and co-workers who also may need electrical work done. Hi Jeff: We just wanted you to know that Matt came on time, got the work done on schedule, and did a great job, and a neat and tidy one too — thank you; and have a Merry Christmas and a Happy New Year. Thanks for following up, we were very pleased with the work conducted last fall. Thank you Liz … Mum has been very happy dealing with you and Jeff. I really appreciate you directing me to ESA a couple of weeks ago. We were going in the wrong direction about getting an independent opinion about what needed to be done for a safety report. I have sent the letter on to Mum’s insurance broker and asked Mum to call you with her Visa number to pay the bill. Thanks again. Just a short “thanks” for a great job; both ceiling fans look great, and I appreciate getting the installation done without having to patch any drywall. We are always pleased with the service you provide and you are the only Electrical Contractor we use. True professionals and it was great you leave the house as you found it … thanks so much! These folks couldn’t wait for Bestway to do their job and then wrote to us about their experience. Live and learn. I did get the switch fixed but the guy butchered my drywall. Instead of just replacing the switch as it was, he cut into the wall and enlarged the switch to three rocker switches in a row. He had to take a saw to a piece of wood that was in the way in the wall and did so without asking me. Anyway, the hole ended up being slightly bigger than the switch plate. It looked pretty bad. I’ve spent the weekend repairing the drywall. So yes, I got it fixed and no it didn’t really work out well. Anyway, I wanted to get it done quickly. Next time I’ll wait. Enjoy the warm weather! Many thanks for getting the invoice and certificate to me. It’s been a pleasure dealing with Bestway! I will pass on the invoice to our accounting department and a check will be prepared. I’ll ensure that it goes in the mail. Have a wonderful weekend. We had several quotes – you were not the least expensive yet we chose you and we are so glad we did. The technician was very polite and professional. I look forward to enlisting the services of Bestway Electric again should the need arise. I’m very happy with the work, can’t wait to get started on the next electrical project! (well, I think I have to deal with a few other house problems first).I’d be happy to serve as a reference for your future customers as well if and when the need arises. Recently we had Bestway replace our existing bathroom exhaust fans with their recommended Panasonic models. WOW … what a difference! You can barely hear them when they are on and one has the extra lighting we were wanting in the bathroom so that’s a wonderful bonus. Our 13 year old now shows his friends and explains how quiet they are. What a great job! Thank you Bestway!!! Thanks! Everything looks great and the hot tub is working fine. I’ll be calling you in the early spring about outdoor lighting in the backyard. I’ll give you plenty of notice as to our plans and would love your input. We recommend you highly to anyone we meet that has electrical needs. Thanks for the great job. Just a quick thank you from me, Jeff for your patience and such help with getting us straightened out on the X-10 via the Internet. Worked like a charm and I feel confident I can handle this!! Bestway's reputation and quality work has resulted in being recognized by the Electrical Safety Authority. Bestway is proud to be on the ESA's "Authorized Contractor Program"
CFIB is Canada's largest association of SMEs representing over 100,000 firms. CFIB promotes and protects a system of free competitive enterprise, strengthens the entrepreneurial culture in Canada, and gives independent business a greater voice in determining the laws that govern business and the nation. 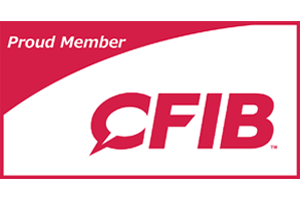 A non-profit organization, whose members work in all sectors,CFIB is non-partisan and is financed solely by membership dues. As a matter of policy, CFIB does not endorse or promote the products and services of its members.